Played Jr. Hockey with the New Westminster Bruins 74-75 and 75-76. Picked in 1sdt round-10th overall by Atlanta in 1976 NHL amateur draft. Picked in 3rd round by the Edmonton oilers of the old WHA. Signed with atlanta and played first year pro for Nova Scotia Voyaguers in 76-77 Calder Cup winners. 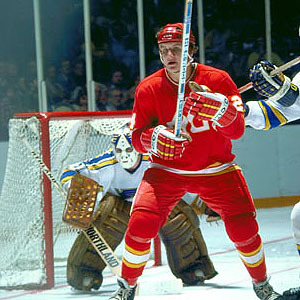 Played rookie year in NHL for Atlanta in 77-78. Set penalty min record for rookie with 128 and scored 5 points in a single game. Traded to Chicago in 78-79 season with Tommy Lysiak, Pat Ribble and Greg Fox for Phil Russell and Darcy Russell and Ivan Bolderev. Traded to Vancouver in 1980 for Ron Sedelbaur Also played with the Dallas Blackhawks and Fredricton Express. Retired after 6 years of pro at end of 1981- 1982 season.